Bayana is located in a small plain, 36 km from Bharatpur, between two hill ranges running more or less parallel to each other near the left bank of the Gambhiri river. 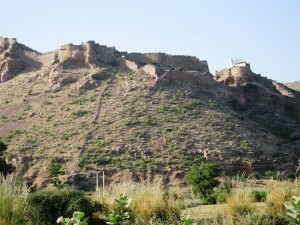 The most visited site in Bayana is the famous Bijaigarh fort, which was built in 1040 A.D. This fort contains several old temples and a red sandstone pillar. One also gets to see an old Usha Temple, which was built during the reign of Raja Laxman Sen, by his wife. This entry was posted in Bayana, Rajasthan and tagged Bayana map. Bookmark the permalink.